Hardy Plants - Agroponic Industries Ltd.
We take great pride selecting and raising both annual and perennial varieties that will tolerate our local environmental conditions. Plant material is selected for our hardiness zone, wind tolerance, drought tolerance, high temperature tolerance, and sunshine tolerance. Annuals in packs 606D’s, 1206’s and 1204’s…. a basic staple. We raise a very wide selection of most for the popular and include various alyssum, aster, begonia ( fibrous ), cosmos, dusty miller, gazania, impatiens, lobelia, minus, pansy, petunia ( dreams ), portulaca, snap dragon, stocks, verbena, viola and zinnia. Our 606D packs are the deep package which provides 35% more volume for rooting as compared to stand 6 packs. A greenhouse would not be a greenhouse with out offering a fine selection of vegetable seedlings and transplants. That is especially true in rural greenhouses such as ours. Vegetable seedlings are offered in 606D and 1204 packs and include selections of cabbage, cauliflower, broccoli, kohlrabi, chinese and oriental green, and our hugely popular selections of gourmet sweet corns. Vegetable Transplants are all offered in 3.5” sq. inserts. Raised from seeds we offer 35 proven varieties of tomatoes, a fantastic selection of pickling, slicing and european cucumbers, zucchini, squash and pumpkin. All vegetable transplants are offered as 2 plants in a pot. Herbs over the last few years have become hugely popular and are offered as well established plants in 3.5” inserts. Our herb offering include : chives ( onion and garlic ), lavender, lemon grass, oregano, rosemary, various basil and parsley varieties, cilantro, lemon balm, mints ( peppermint and spearmint ) and tyme just to name the popular. Tomatoes are also offered in 5.5” inserts and 2 gallon pots to those that wish larger planting material or get a late start on the growing season. Come in and visit our selection of zone hardy perennial selections. Selections include a wide range of Rock Stars, Jeepers Creepers and Heritage perennial selections from Valleybrook Greenhouses, Byland’s and locally grown. Gardeners sometimes refer to these as Perennials for style and performance. Perennial selections that we offer are all zone 1 and 2 hardy. This is our commitment to our customers. Nothing less than hardy high quality perennials year after year. Every year we feature new hardy, vivid and show stopping plant varieties. Come in an check them out! We raise a diverse selection of pot/planter stuffers in 3.5”, 4.5” and 4.5” pots and represent high quality, and new selections from Proven Winners, Proven Selections, Selectra , Ball and Pan Am seeds. Stuffers are gaining greater use year after year as skilled gardeners prefer to select plant material for their individual needs. Stuffers are generally chosen because of their growing traits. 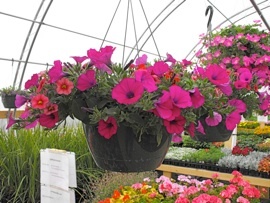 There are various trailers for your pots and baskets, vivid flowering show stopping verticals for center pieces and multicoloured and textured vegetation for sculpturing. We have a huge selection of single and double calibrachoa, arctotis, argythemium, bacopa, begonias, bidens, bracteantha (strawflower ), carnations, celosia, coleus, dahlias, dianthus, diascia, euphorbia, fushia, geraniums, gerbera daisy, glechoma, gypsophila, heliotrope, NG impatiens, ipomoea ( sweet potato vine ), lobelia, lobularia, creeping jenny, nemesia, dracena and other ornamental grasses, opteospernum ( african daisy ), oxalis, cool wave pansy, petchoa supercal, petunias (crazy, rambling, ray, starlet, and the wave families, easy wave, wave, shock and tidal, just to name a few), scaevola, setcreasea, thunbergia, trixi-liners, and verbena. 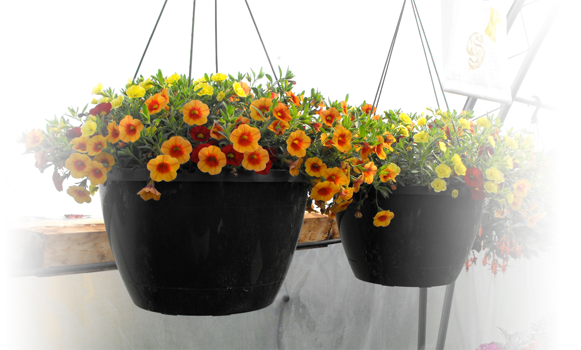 We offer stunning selections of single and multi-variety 12, 14” and 16” hanging baskets. Vibrant colour selections of Supertunas mixes, Wave Petunias, to mixed selections including Calibrachoa, Verbena, Bacopia, Begonias, and Fuchsias to name a few. 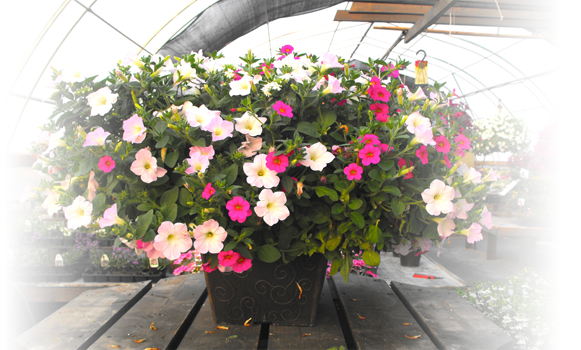 Baskets selected for sunny locations, basket selections for semi shade and full shade locations, with windy hardy selections just to name a few. Heck, a few pictures are worth a million words. So take a gander of a few of them for yourself. Healthy, vivid colours, complimentary colour selections, balanced symmetry, and boldly displayed. Baskets are very heavy feeders. Water well everyday. For outstanding results use a high quality water soluble fertilizer at low rates daily as well. 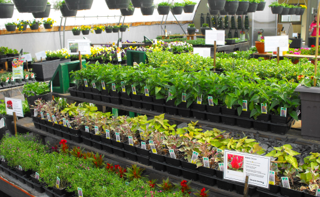 Come in and visit our selection of zone hardy perennial selections. We take great pride in starting the majority of our perennial collections from seed, cuttings or bulbs right at the greenhouse and generally overwinter for a one winter before offering for sale the following spring. We also ensure all our perennial stock is hardy for our zone. Our customers are provided with hardy high quality plants. Our perennial offering vary a bit from year to year and depends the the previous years seedling, cutting and propagation programs. 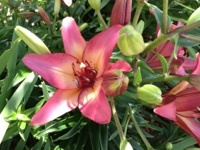 Our mainstay selections includes; various varieties of peonies, bleeding hearts, ferns, daisies, iris ( siberian, bearded, reblooming and select dutch ), lilies ( trumpet, asiatic, oriental, tiger, and martagon ), daylilies, just to name a few. 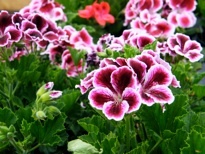 Perennials are offered in 5.5” liners, and 1 and 2 gallon containers. During the last few years we have developed quite a following for lilies and have been very successfully in propagation of many varieties. 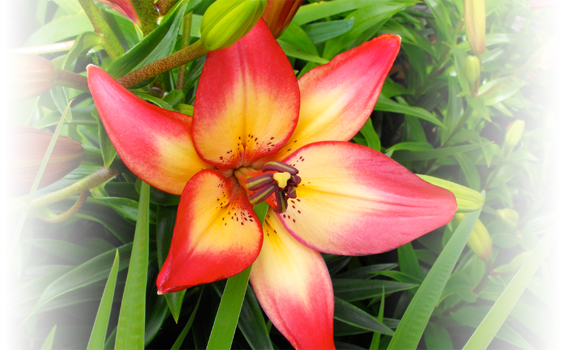 What is not to like about lillies? They are easy to grow, not demanding, and are simply thrillers of flower beds. Here are a few of the samplings we offer.